A record 71 pole positions and counting. Of all Lewis Hamilton's many skills as a Formula 1 driver, this is one talent he has really made his own. Race after race, Hamilton redefines the boundaries of the possible with those flat-out laps that decide the grid order - and quite often the race victory, too. It is a moment when the essence of a grand prix weekend is distilled into 90 seconds of purity - the quickest cars on earth, and 20 men driving as fast as is humanly possible. "It's shorter," Hamilton says. "It's intense. It's enthused with so much energy. The pressure is at the utmost. You go out, and you have that one lap to perfect and deliver. I love that challenge. "It is the ultimate performance, putting all the pieces of the performance together and I have always loved that. That's when you attack. It's when you really go into battle. The car is light, it is the fastest you get to drive at any point in any weekend and it all comes down to that one moment and the decisions you make and I love it." In a sport where margins are measured to the thousandth of a second, Hamilton is frequently several tenths quicker than other drivers - even ones with the same car. Ten poles in 16 races this season, a year when Mercedes have faced real opposition for the first time since 2014, tells its own story. These are laps that make the jaw drop, that generate awe and admiration, even among his rivals. But they are not just down to Hamilton alone. A qualifying lap is the culmination of all the work an F1 team puts into the weekend, and the driver could not do it without the people behind him. So how does Hamilton do it? BBC Sport took a deep dive behind the scenes at his Mercedes team to find out. Hamilton describes himself as "really just a small chink in the chain of a large number of people who make it possible". It is not false modesty - it's a statement of fact. But it is undeniable that it would not be possible without the ability of the man in the car. Mercedes technical director James Allison has worked with all three of F1's current multiple world champions and describes Hamilton as "a magnificently quick driver". How quick? Well, in 10 years of F1 Hamilton has had five team-mates. In terms of championship points, Fernando Alonso has equalled him (in 2007), and Jenson Button (2011) and Nico Rosberg (2016) have narrowly beaten him in the title standings once, even if there were extenuating circumstances each time. But in raw qualifying pace - taking an average of their speed over a season on quickest laps where a comparison is possible - no-one has ever been faster. "In the races we could have some great battles," says Button, Hamilton's team-mate at McLaren between 2010 and 2012. "He'd win a race, I'd win a race, and it was really close between us. But when it came to qualifying, it wasn't. He was just immense." Talent on its own is not enough, though. An F1 car is a complex object, and it needs to be fine-tuned to get the best out of it. And a driver is a human being, prone to distractions and weaknesses, which need to be eliminated for him to operate at his best. Hamilton admits this has been a flaw in the past. "It is definitely an area I really wanted to improve this year," he says. "It has always been something I have enjoyed and generally excelled at. [But] it is all about the small percentages, and getting those extra little bits out of your own performances has really been my goal this year and I have managed to do that. "You've seen how I live my life over the years and I really think the balance I allow myself to make is what enables me to perform the way I do. "I arrive at the weekends in a positive frame of mind. I don't have any baggage. I generally don't give a you-know-what about what anyone says. I know my values, who I am and what I am about. I know what I am here to do, so I do it. "I guess it is about building a force field against all the negativity that generally tries to penetrate. Nothing generally gets in and I know how to race and drive. It is about doing it." The change in 2017 has been noticed at Mercedes. Chief strategist James Vowles describes an upshift in Hamilton's "attitude and approach to a race weekend". "There were times last year," Vowles says, "where he would be on the back foot sometimes coming out of a Friday and it would take him time to build that confidence and ability back up as he went into the race and in the most extreme cases it would allow Nico to out-qualify him. "He has aged a bit, he has become more mature with things. Things you know have failed you in the past, you fix them and improve them if you want to move forward as an elite athlete and that is what he is. "So he has taken a reflection of what happened last year and improved on the small aspects things that he believes contributed perhaps to him not extracting everything in 2016. I am seeing a man who has changed and fixed those things and adapted. It is an impressive sight to see." The general perception of Hamilton is of a mercurial character who relies on raw talent to make up for weaknesses in the more scientific side of the requirements of a grand prix driver. But the general perception is wrong. Mercedes team boss Toto Wolff says: "Lewis is a hard worker. He is very diligent in his approach and on a very steep development curve. He is someone who is never satisfied with his own performances and tries to better himself every day. "He never settles. He is never happy with where he is as a racing driver and a human being. He wants to optimise, he wants to develop, and we have seen it very much in the team. "He has become very much part of the leadership of the team. When times are difficult, he is calm and motivating the other members of the team but he is also capable of being very objective and natural about his and the team's performances and that made him become a strong pillar of the team." Vowles adds: "Lewis this year has made another step as a driver. His approach to the weekends is a lot more scientific than I have seen from him before. He applies more science, more work, more practice. He is working much closer than I have seen him before with the team, because he knows everything matters in terms of the championship. "That is not to say he wouldn't have done that in times of old. [But in] 2014, '15, '16 we had a car advantage and Lewis was a little more internalised; he didn't necessarily need to rally the troops as much as he is at the moment. "This year, I have seen a new step from Lewis where he is able to properly exploit everything the team can provide him so they provide him everything he needs to be able to go and get pole position. "It is no one element. It is not that he watches more videos or looks at more data or spends more time talking to the engineers. It is everything that he has improved by 1% that allows him to extract a lot more from the car." Hamilton says: "Ultimately you've got these really intelligent individuals and it's about trying to make sure you get 100% out of each and every one of them. And they need to understand what they need to give you. "If you don't give them the information of what you need, they can't guess. Building on our routine so they know exactly what they need to do to provide me with the platform I need to deliver what I deliver, for me to arrive into qualifying in that frame of mind I have. Collectively that's how we have the poles we have." The all-important laps in the the top 10 shoot-out at the end of qualifying - or Q3, as it is known - are just the climax of a long period of preparation. It starts back in the factory, where engineers pore over data and try to give the team what they think will be the best baseline with which to start the car at a given track. Through the three practice sessions, the team work with the driver to hone the car so he feels as comfortable and confident as he can taking it to the limit. And then comes the crucial hour on Saturday afternoon. "Once you enter qualifying," Vowles says, "you will notice quite a change of atmosphere in the team - doesn't matter whether it's Q1 or Q3, it is quite serious and orchestrated." The team have to negotiate their way through two knock-out sessions, making sure they judge the lap-time improvements of others correctly to avoid embarrassing early exits, making tyre choices and doing just enough running so the car, tyres and driver are in the best possible condition for the last 10 minutes when it really counts. Given the complexity of modern F1 cars, with hybrid engines, energy regeneration, hundreds of settings and temperamental tyres, it is no easy matter. "You need to make sure the driver has entirely bought into the psychology of what you are trying to do in qualifying," Vowles says. "There is no point giving him a set of tyres and then saying off you go. You need him to be providing feedback. "A lot of it is about getting the driver in the right mental state. The car performance is one aspect of things but you are asking drivers to find the absolute limit of their and the car's performance and to do that you need the driver in the right mindset and bought into what the team is doing as a programme. "Over the recent years he has just got better and better by learning how to combine that enormous talent with the understanding of the technical side of the tyres and the power unit and the chassis and bringing it all together." A qualifying lap is a journey into the unknown. It is the fastest the car will ever go on that track, and by definition it is something the driver has never done before. A driver is doing something most people have only a vague understanding of. He is trying to take the himself and the car to the very limits of possibility. It requires a combination of balance, bravery, feel, dexterity and commitment that is almost indescribable. From the outside, on television, it might look relatively controlled, but that is the mastery of F1 drivers. In reality, the car is on the very edge at all times. It's not so much about not losing control - although that is the extreme of failure. It's more like a dance, although there is no easy metaphor. At each corner, the driver must brake as late as he can without locking a wheel, enter as fast as possible without sliding too much - although the car is sliding all the time - get on the accelerator as early as he can without spinning the wheels too much. All that while being subjected to extreme g-forces - up to 6G longitudinally during braking, well over 5G laterally in the fast corners. Mercedes non-executive director Niki Lauda, a three-time F1 champion, says: "A normal human being, they operate in a normal way. They say good morning, good evening. They have breakfast, lunch and dinner and they live their normal life. Sometimes more or less exciting. "But when you are a racing driver and you have to deliver, that is a different ball game. Lewis can certainly deliver. "It means he sits in his car and says: 'It is one lap now, I have to get pole position.' And he switches something on which very few people have, and this on-off from nothing to everything he is able to do in no time, and then he can squeeze out the last couple of tenths. "Easy to do that when you push hard, then you make a little mistake, you go too far, you brake too late, you do all these kinds of mistakes. But on his laps he does no mistakes and drives the car right to the limit on every metre of the circuit. That makes him different." Even once out on track, the lap has to be prepared before it is driven. Lauda adds: "He sits in the car, get the right tyres on the car. You dive out of the pits, then you have a plan. How many corners, how quick to get these tyres to the peak point at the last corner before the lap starts? "So he has to bring up the temperatures. If they are too high at the start he will lose out. So he needs to understand how closely to bring the grip level to the optimum. "Then he has to go flat out, brake at the absolute best point without stopping a wheel, or coming off the line. Then he turns in and gets into the rhythm of what he can do. When he does the first corner well, the next corner comes easier, still going on the limit, over the kerbs, then he is in a normal rhythm to finish the lap. So if the tyres do not go weak in the lap, which can happen if he pushes too hard, then he has pole position." 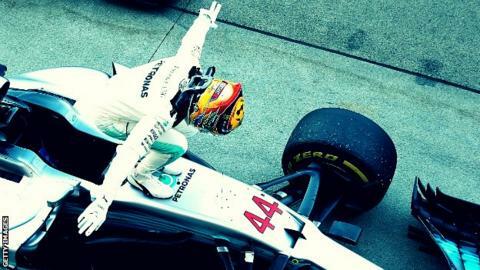 For Hamilton, this is the moment where all that preparation gives way to instinct and ability. Not for him techniques beloved of sports psychologists such as visualisation. "I have never visualised a lap," he says. "I tried it many years ago. For me personally, it is a complete waste of time. It did nothing for me. "You can't predict what you are about to do. You can't put in your mind that you are going to turn at this point. "It is the greatest thing about racing these cars, it's that it's all on the dime, it's all on the split second - how you react, about the snap overseer that comes. You can't predict that; you just have to be ready. It is about being on your toes and I love that. So many balls are coming from so many different directions. "What I can definitely advise any kid that's out there trying to race, don't listen to people who tell you you need a mental coach or you need someone to help control your mind. "You need to let it run wild and free and discover yourself. It is all about discovery. And only you can do it. No-one can tell you: 'Don't do that because I have done it before.' You have to experience it in order to learn and grow from it." What does he do that others don't? Driving an F1 car is all about adaptation. The car is very rarely perfectly balanced. It will always have a handling characteristic that the driver would rather was not there - a slight lack of front grip (understeer), too much rear sliding (oversteer), whatever. What marks out the best drivers is their ability to adapt to those problems and deliver the very best anyway. Button says: "With the car, even if the balance wasn't quite there, Lewis was strong. He would drive the car from the rear. He didn't mind oversteer on entry, apex, exit. He was a little bit more ragged than my style, but it works." Vowles adds: "Of all the drivers I've ever worked with, Lewis is the one who is able to quickly and dynamically react to a changing set of circumstances. That's one of the key reasons as to why he is so good in qualifying. "You have echelons of drivers throughout the grid. You have the Alonsos, the Lewises and the Vettels of this world, who are at times in a league of their own. Until you have referenced them all together at the same time in the same car you will never be able to answer who is the best. "I think Fernando is exceptional as well but there are times when he isn't extracting everything that car has to bring - at all. It is difficult to find your motivation perhaps when you are behind but with Lewis I don't ever see that lack of motivation. And again Sebastian there are times where he had a faster car and Lewis has managed to beat him. By milliseconds - but has managed to beat him." When Hamilton broke the all-time record for pole positions this year, one phrase kept coming up in responses from his fellow drivers: He deserves it. They all know how good he is. They see that he is doing things that are special and unexpected, that he is getting speed out of the car that, for all their data and computer predictions, not even the team knew were there. The most recent example was Malaysia two weeks ago. Mercedes had the third fastest car at Sepang, yet Hamilton somehow put it on pole. Team-mate Valtteri Bottas was fifth on the grid, 0.7secs behind. "On all the statistics I had," Vowles says, "we were not on pole that weekend. We had been off-set by 1.4 secs on Friday, by 0.6-0.7secs on Saturday morning. And there is nothing in any of those metrics that tell you: 'Yeah it will all be fine if you push a bit more and turn the power-unit up, pole will be yours. "That's what I call exceeding expectations. I was ecstatic in Malaysia. I can't explain it any other way, because it is an achievement you know you've realised because you have a driver who is able to extract everything from the car at any one given time." For Vowles, though, that was not even Hamilton's best lap of the year. "It was one that definitely blew me away but I don't think it was his best of 2017," he says. "I would have to go back through my notes but there were others that I thought were a much better achievement overall. "The way I define a best lap is not just where he finishes relative to the field, it's how clean it was, how he built up, did he make any mistakes, any small lock-ups, any small adjustments in the steering wheel. And I believe there was one prior to that where it was perfect and I can't remember which one, I'm afraid." After the interview, Vowles checked his notes and it turned out there were actually two laps that exceeded Malaysia. They were Silverstone, where he was on pole by 0.5secs from Ferrari's Kimi Raikkonen and 0.8secs quicker than Bottas, and Italy, where in the wet he was 1.1secs quicker than anyone else and 2.3secs up on his team-mate. Brawn says: "It's a very special experience as an engineer or team principal to know that the guy is going to pull his belts in a bit tighter, take a deep breath and find something that is almost indefinable. There are only a few people who've got that. "That raw talent; it's that one, two, three tenths. The interesting thing is that team-mates in those circumstances can never work out where it's coming from. "You always see it. They get a new team-mate. They come up against that raw talent. They want to find the reason why it's there and ultimately they have to understand the guy's special." Could veganism compromise Hamilton's 'racing edge'? Read more on Lewis Hamilton: Could a vegan diet hamper his 'racing edge'?